Police: Did You Lose This Wallet Made of Money? Have you recently lost your wallet? Do you live in the Colorado Springs area? 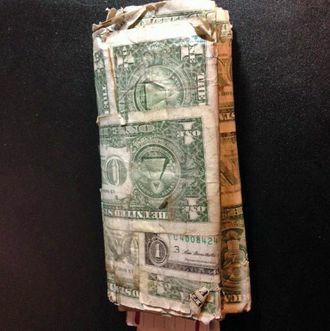 Is your wallet made of actual grungy one-dollar bills and held together by clear tape? If you answered yes to all of the above, the Colorado Springs Police Department would like to help reunite you with your lost cash. According to the CSPD Facebook page, the “very unusual wallet” was turned in recently to the Stetson Hills Division. If that means anything to you, please contact them here about claiming your lost item. And once you do that, please contact me to answer my many burning questions about why you made your DIY wallet with your own money. What inspired you? Would it cost more to just buy a simple wallet? What is your preferred brand of tape? How can I make my own? I think we could have a great Facebook Live segment on our hands here.